We have two topics for this blog: one for temperature monitoring of bulk concrete pours and the other focusing on the Silver Schmidt Hammer and converting its Q value results to R values common to older correlation curves built using an Original Schmidt. Apart from that, we are pleased to announce our End of Financial Year Sale. We would like to use it as an opportunity to show our appreciation for your support of PCTE throughout the year. Full details about the EOFY sale can be found on our website. In order to get small businesses (earning less than two million per annum) fired up, on 12 May 2015, Joe Hockey proposed a tax break for EACH and EVERY item costing less than $20,000 used for running your business. Once legislation is passed the tax break will be backdated to 12 May 2015 accordingly and this limited opportunity will disappear 30 June 2017. This will be 100% tax deductible. What this means in increased cash flow and the chance to invest in your business early, allowing small business to increase their capabilities and hence services to customers. Do not miss this rare opportunity to grow and develop your business. Please have a happy and safe EOFY! There is a history of using rebound hammer tests to estimate Unconfined Compressive Strength (UCS) of rock. This article looks at developments that allow older R (rebound) value results from Original Schmidt Hammers to be compared with Q (velocity ratio) value results from newer Silver Schmidt or Rock Schmidt hammers. As there are many older correlation curves for rock it is valuable to make this conversion allowing the use of a more modern rebound hammer. Improvements in NDT tests have focused mainly on improving data collection, presentation and comparison. Initial improvements added digitisers to conventional tests to collect the values automatically. The Silver Schmidt is an interesting case as it uses a different dimensionless value but the same test principal. Both measure the energy returned after impact with the plunger and rebound of the hammer mass. R values are a measure of the rebound height vs a fixed scale of the hammer for all mechanical and early digital rebound hammers. R values are by their nature effected by the direction of gravity relative to the hammer orientation The Q values produced by a Silver Schmidt hammer instead measure the velocity of the mass before and after impact. The Q value is the ratio of these velocity. Q values are not affected by the direction of gravity. Both measurements measure the same thing, energy of the rebound, and can be correlated to a UCS value for many materials. 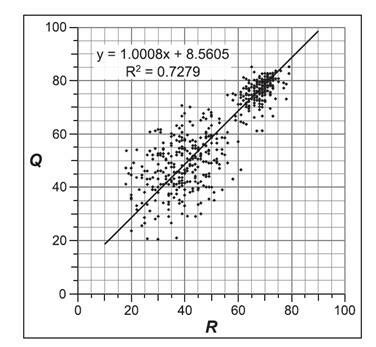 Winker & Matthews 2014 examine the ability to convert between Q and R values in the context of exposure age dating, but the results are applicable to UCS conversions and concrete strength testing as well. Their investigation was to examine Q and R values obtained in controlled field conditions and determine the feasibility for conversion between value types. N-Type hammers [the higher impact energy of 2.207J) were used for the comparison. Sample sites used were closely co-located testing points on natural rock, a soft tarmac (used to collect low energy values) and a steel calibration anvil (to collect very high energy values). Results were graphed for the rock samples. As can be seen in the image above there was a tight grouping for young less weathered rock, and a looser grouping for older weathered rock. The line of best fit is linear and after analysis corresponds to a conversion ratio between 9.6 and 10.1. Paired t-tests for every sample field test obtained for Original and Silver Schmidt hammers were completed and all showed a mean paired difference that were statistically different at p < 0.05. This conversion ratio agrees well with results obtained on the steel calibration anvil, but does not work well with the very low strengths obtained by asphalt, converting between results is not recommended for very low strengths. However this may be due to poor performance of N Type hammers at low strength values and therefore an L Type (0.7J) might give better results. 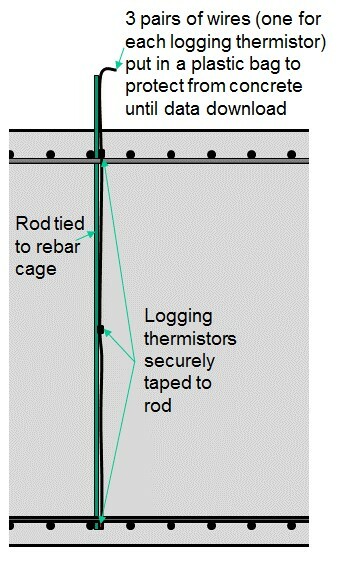 a) Thermocouple wire and a standard data-logger. b) Single channel wired or wireless data-loggers that collect the data for one sensor. Long cable runs and vulnerability of onsite loggers can make a) and b) expensive, unreliable and difficult to use. Many thousands of the discrete loggers are now used each year in Australia because of their ease of use and reliability. Liquid nitrogen was used to reduce the delivered concrete temperature and hence insitu temperatures for mass concrete pours comprising a dam in Queensland. A fully wired central data logging system was purchased to monitor all pour temperatures but frequent thermocouple failure meant results for many pours were not recorded. The Intelli-Rock system with internal logging as described in c) was purchased and site engineers found the system easier to operate and totally reliable. Sometimes a set of sensors are also tied to reinforcement at the edge and corner of a pour to enable analysis between the edge temperatures and temperature farthest away from the center. Where differential temperatures between new pours and restraining old pours define the stripping time, temperatures adjacent to the old pour can also be monitored.